I Finally Tried Chicken Marbella, the ’80s Classic, and I Have Some Thoughts! It鈥檚 hard to find cookbooks that actually do something. 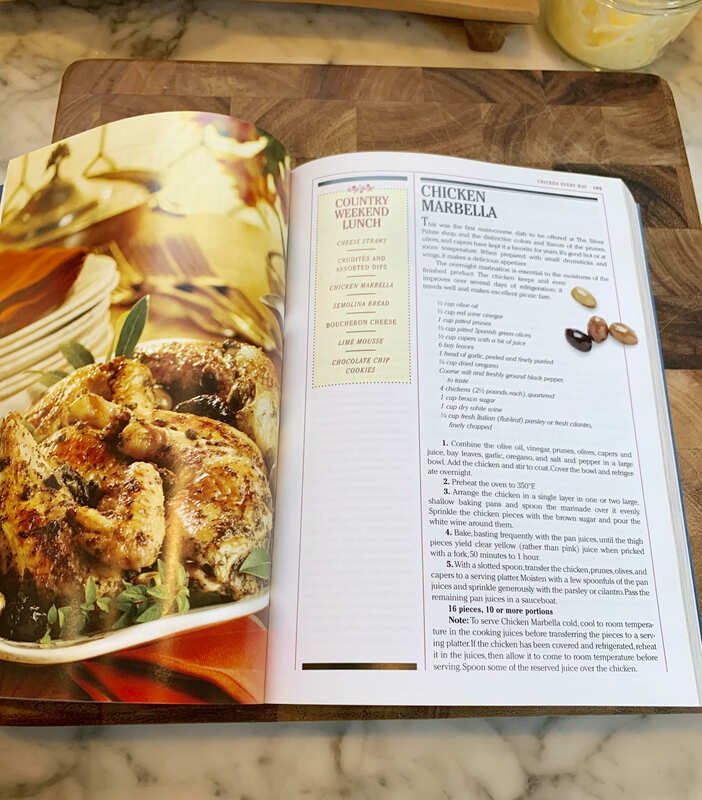 If a cookbook is lucky it inspires a bit of conversation among the food-erati; it adorns bookshelves and coffee tables; it makes Ree Drummond or Ina Garten even richer. But rare is the cookbook that actually sells enough to make a dent in the way mass America cooks. If you want to talk about cookbooks that can actually still be tasted today, you have to talk about The Silver Palate, published in 1982 by Sheila Lukins and Julee Rosso. Released at a moment when Parmesan and pesto were exotic, and French cuisine reigned at the top of the gourmet charts, this book has sold millions of copies, thanks to its exuberant, freewheeling fusion of Provencal, Asian, Mediterranean, and other (at the time) novel flavors. 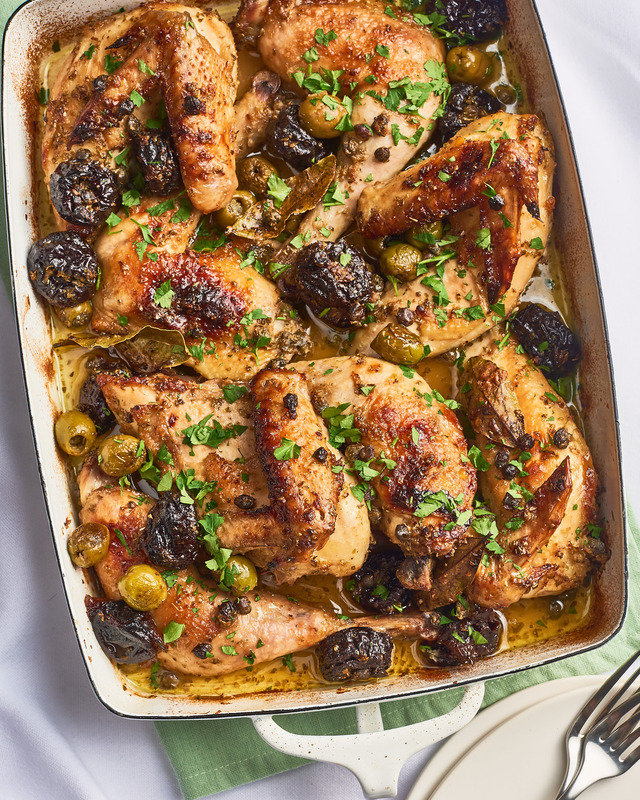 And it is best represented through its signature dish, the one that speaks of special occasions to millions of food-lovers: chicken Marbella, where prunes meet capers, and chicken meets your mother鈥檚 dinner table. What Is the Silver Palate Chicken Marbella? 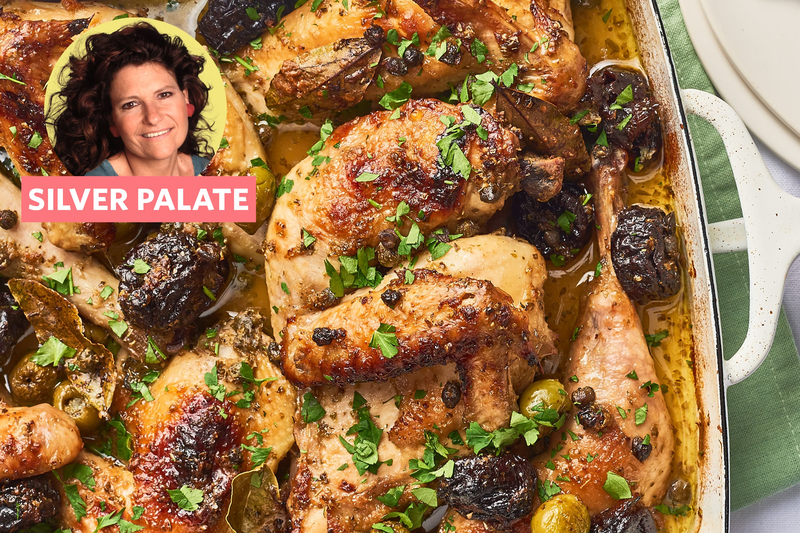 Chicken Marbella was already a star by the time the The Silver Palate was published, a favorite at the Upper West Side food and catering shop that gave the cookbook its name. It appears in a 鈥淐ountry Weekend Lunch鈥� menu on that same page in the book, alongside cheese straws, semolina bread, lime mousse, and chocolate chip cookies. Fancy comfort food, 鈥�80s-style (may it never go out of fashion). 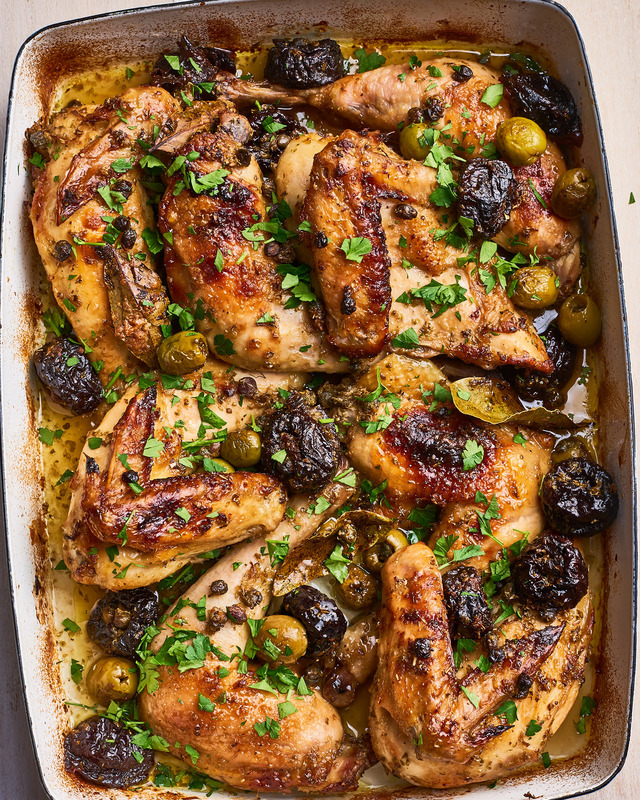 The chicken is tossed with a very rustic blend of pureed garlic, olive oil, red wine vinegar, dried oregano, and bay leaves, then tossed with the famous elements that give this dish its character: prunes, olives, and capers. Mediterranean mish-mash! An overnight marinade is a must, and makes this also an easy make-ahead dish; it鈥檚 great to put it all together and then in the fridge for easy roasting the next day. Well, I have been putting off this moment for as long as I can, but I have to confess: For all its years of dinner party success, I just couldn鈥檛 love chicken Marbella. Beyond this, the roasting method for this chicken, in our age of high-flavor, high-smoke-point, barbecue-tainted palates, seemed weak. The chicken skin stayed flaccid instead of crisp; the chicken itself was fine and tender, but not melting. The sweetness of the sugar and the prunes lacked a balance; the vinegar and salt didn鈥檛 bite enough to compensate. It was a dish that was delicious in parts, but not so stunning that I would put it onto my table without tweaks. It might just be me (I mean, this is CHICKEN MARBELLA; how dare I! ), but while I love its story and have the utmost respect for Sheila Lukins and the way she and her partners swept new flavors onto American plates so quickly, the dish felt of its age 鈥� and that age is not now. But we may very well not have those voices and those flavors if The Silver Palate hadn鈥檛 opened the door. I鈥檓 grateful to have tried this little piece of culinary history at last. It was a taste of a time where food was exciting again, a place to show off and have fun and get wild with prunes, capers, and olives. 1. Scale it down: The sheer, catering-inspired size of this recipe is overwhelming; my first recommendation is to immediately size it down to normal-kitchen proportions by halving it. 2. Cut down the brown sugar: Epicurious reviewers suggest cutting the sugar down drastically to 1/4 cup, which is my plan should I ever make this again. 3. Roast at a higher heat: I was a little taken aback by how pallid the chicken was, and I think it needed more heat to bring out the chicken鈥檚 flavor, which would balance the intensity of the prunes and olives. 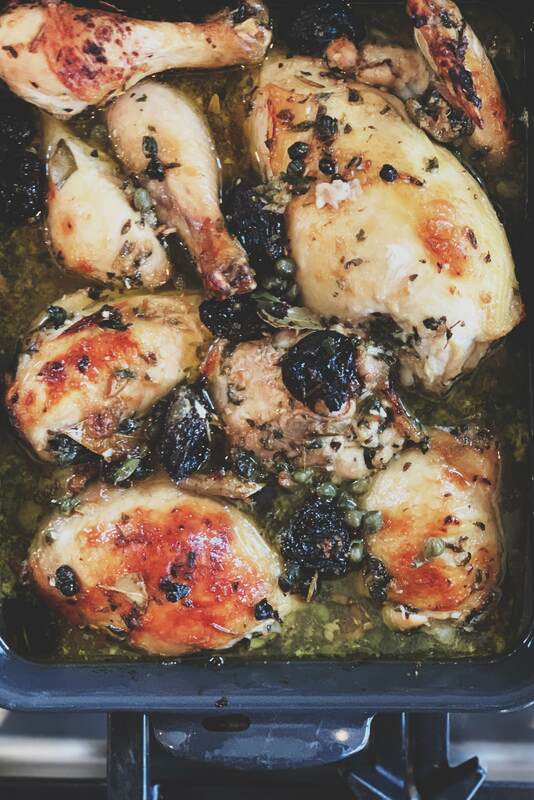 Have you ever made chicken Marbella? Do you love it in all its proto-gourmet glory? Tell me what you love, how you make it, and what memories it holds for you. This recipe was a contender in our March Chicken Champions recipe showdown, in the fancy dinner party bracket. Check out that showdown and its competitors below. The Full Showdown: Who Wins the Title of the Best Chicken Dinner Party Recipe of All?